iGW series products are specialized communication units for electrical facilities that allow data conversion between different protocols. Data from multiple devices (meters, protection relays, and other IEDs) may be acquired using field protocols (IEC60870-5-101/102/103/104, IEC61850, DNP3.0, DLMS, Modbus, Procome, etc.) and can then be transferred to a Control Center using IEC60870-5-101/104, DNP3.0, and Modbus RTU/TCP protocols. 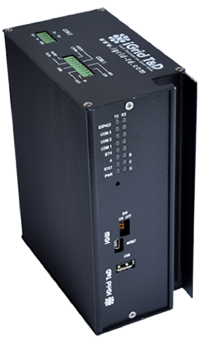 The basic configuration (iGW-B0) includes RS232/RS422/RS485 serial ports and an Ethernet 10/100BaseTX port (RJ45). It also includes an extra serial port (EXP422) for connection with iRTUe devices. These iRTUe auxiliary units can be equipped with two I/O modules (analog and digital), providing the iGW-B0 units with external data acquisition capabilites. This basic configuration may be expanded by adding different communication options, e.g. embedded Ethernet switch (S Series) or built-in GPRS modem (M Series).